Murrieta is located just on the outskirts of Temecula in Southern California. The weather for the weekend was warm after months of a cold winter of that rained consistently. The hot temperatures were a shock to the system for some of the riders. For the Pro 1/2 race, the Tour de Murrieta Race Circuit Race was a 56 mile race that raced in the rolling hills of Murrieta along the foothills. The field was 80 plus strong and had full squads from the Cylance and Elevate / KHS pro teams, along with SDBC and the SoCalCycling.com Team. The Circuit Race is a somewhat technical course that favors riders with solid bike handling skill and strength, as the heat, undulating course and wind make for a tough race. According to Announcer Ralph Elliott, the blistering pace set in the Pro 1/2 race broke the course record from previous years. The race started with Rene Corella (Start Vaxes Cycling Team) in the leaders jersey, as he was the most consistent over the the first two stages. The SoCalCycling.com Team was in second GC going into the day with Callum Gordon three points back and Cory Lockwood (Elevate / KHS) was five points back in third. As the race took off, the Cylance Team was aggressive after just missing a win in the previous days Criterium and was focused on going for a stage win and set the pace. With a quarter of the race completed and many attacks, there was a break that looked like it might have some legs that consisted of Tyler Locke (SoCalCycling.com Team), Rene Corella (Start Vaxes Cycling Team), Brian McCulloch (Elevate / KHS) and Sean McElroy (NCCF / Specialized). The break would get about a fifteen second gap and worked well together. The main team missing was Cylance, and needed Cylance to be in the break to be successful. The break stayed off the front for almost three laps and as riders started to tag on, it became doomed. The group was all together and many attacks came on the rolling hills only to spit off some of the riders each lap as the field dwindled from the fast pace and the heat took its toll on the riders. With three laps remaining, a breakaway formed with most of the players in the break, minus race leader Rene Corella (Start Vaxes Cycling Team). This was the big move that was going to stick as everyone in the break was organized and was working well. The break included three Cylance riders, three Elevate / KHS riders and two riders from the SoCalCycling.com Team, along with some other strong riders this would form an eleven man break that was going to bump up Cory Lockwood (Elevate / KHS) and Callum Gordon (SoCalCycling.com Team) on the overall GC. So this was perfect for all of teams. As the break hit one lap to go, the break was out of reach from the peloton and the winner would come from this group and the overall GC would change. So heading into the last corner, Eric Marcotte (Cylance) headed into the finish solo with a seven second gap to work on all his winning poses. Leading the charge for second was strong man Karl Menzies (Cylance) and finishing a solid third was New Zealander Callum Gordon (SoCalCycling.com Team) who is coming off of a few solid weeks of racing in the US. The final overall GC win went to Callum Gordon (SoCalCycling.com Team), with Cory Lockwood (Elevate / KHS) in 2nd and Rene Corella (Start Vaxes Cycling Team) in third to round out the top three for the overall GC. A huge thanks to the Stage 2 Cyclery and all the volunteers that make the Tour de Murrieta such a great event each year! 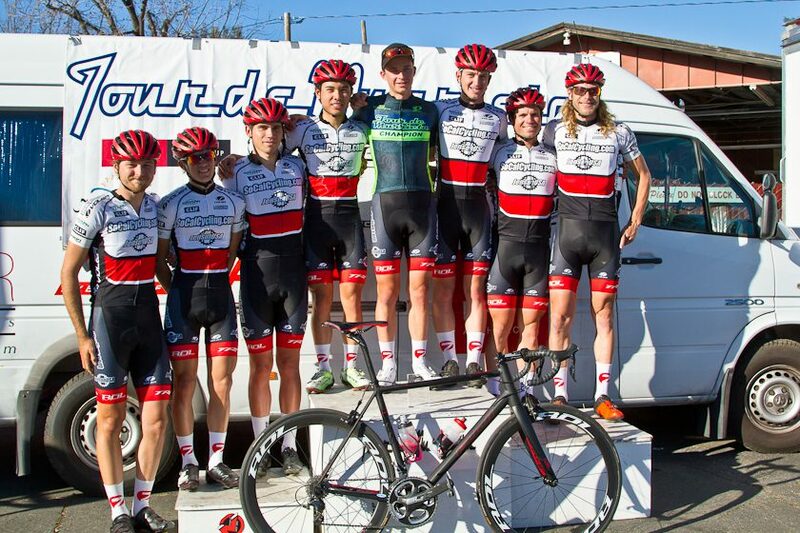 Check back to SoCalCycling.com for a photo gallery from the Tour de Murrieta Circuit Race.